You're rarely indecisive—except sometimes when it comes to matters of the stomach. 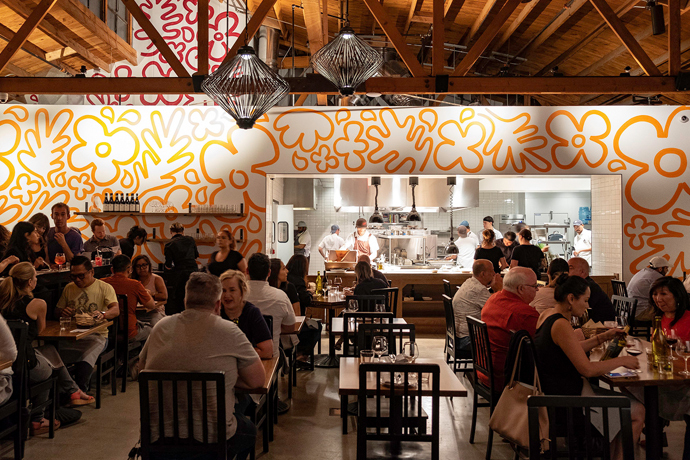 Santa Monica's new restaurant Hidden, soft opening at the end of the week, aims to coddle you in those moments of culinary indecision. Can't choose between Japanese, Spanish, Italian or Vietnamese? Don't worry, you don't have to. Located in the old Schatzi on Main space, the stogie-chomping haven founded by the Governator, Hidden is tucked away in the back of a central courtyard in an otherwise nondescript office building. The name and multiple menus sound like a gimmick gone horribly awry—until you step through the gates and see a host of inviting cabanas, a greenery-choked patio lounge, the central zinc-top bar and, inside, a more formal dining space with Missoni carpets linking a sushi bar to plush leather banquettes. Suddenly, you might be willing to give Hidden's everything-to-everyone philosophy a chance. If you're thinking Japanese, try the hamachi cubes. If you go Vietnamese, you might sample a skewer of short ribs in lemongrass. Spanish? The charcuterie to start, of course. And if you really want to get authoritative, the $300 pizza covered with crème fraiche, lobster carpaccio and Beluga caviar would announce your Italian leanings with stunning conviction.